Today we filed an amicus brief in support of a petition for certiorari challenging the government’s ability to track citizens through Cell Site Location Information (CSLI) obtained without a warrant. In this case, the trial court allowed the government to introduce 28 months of CSLI obtained by a prosecutor using a mere Grand Jury Subpoena. We argue that the Carpenter v. United States decision, issued in 2018, affirms the protection of CSLI under the Fourth Amendment, and the third-party doctrine does not apply. Our brief explains why the “good faith” exception applies only to police, and not prosecutors. 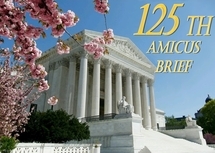 This brief, filed in the U.S. Supreme Court, is our third amicus brief in support of Philip Zodhiates.